I’m continuing my look at all the recently released Hammer films from labels such as Indicator (Powerhouse Films) and Studiocanal. The film I’m looking at here is a psychological thriller from the Indicator Hammer boxset titled Hammer Volume One: Fear Warning. Does Maniac look as splendid as the rest of the films it accompanies? Well it’s time to find out so without further ado here’s my Maniac Blu-ray Review. Jeff is an American artist who happens to be on holiday in France when he decides to stay in a nice quite town and maybe paint a few pictures. The hotel he stays at is run by Eve Beynat who also has a stepdaughter Annette. Eve and Jeff become close and she reveals to Jeff that her husband has been put away for torturing and murdering a man that interfered with his daughter. In fact the doctors think he has gone mad. However the film is called Maniac and all is not necessarily as it seems. Maniac was directed by Michael Carreras with the cinematography been handled by Wilkie Coopern. The film is shot in black and white which actually plays to the movies strengths and gives off a film noir feel. Set in southern France the film looks excellent with both locations and sets holding up very well. The film moves along nicely before doing an exceptional job of throwing in a massive couple of plot twists. The music is by Stanley Black and is the very good at creating tension and has a few stingers to really emphasis key plot points in which the film takes a huge change in direction. That said the film begins with a high tempo kind of Jazz which completely threw me as to what kind of thriller I thought I was going to see. Maybe this was done intentionally but there’s no getting away from the fact that the music seems to be a mismatch with what we are seeing. As the story proceeds there is a shift into a more conventional tense thriller style of score. Everyone puts in good solid performances and this really helps when the twists come, and I for one didn’t see them coming. 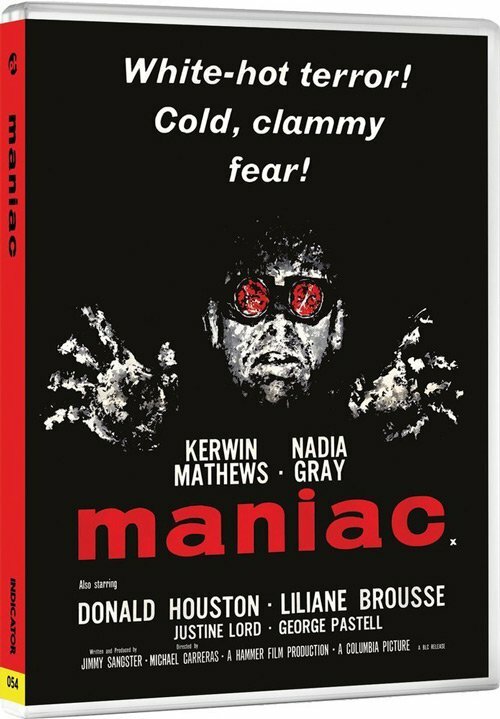 Maniac is another of the lesser known Hammer films and like Fanatic rarely is shown on television in the UK at least. Maniac is a must see Hammer thriller that does an excellent job of misleading right up until the end. This is one those films I consider somewhat of a forgotten gem. The picture quality on Maniac is perfect, it’s a black and white film and the image is clean and sharp without out any annoying specks of dirt. This is indeed another excellent Hammer Blu-ray release from Indicator. On the extras front there’s a rather interesting documentary, White-Hot Terror: Inside “Maniac” in which Hammer expert Jonathan Rigby shares some interesting facts surrounding the film’s production. Maniac (1963) is available now on Blu-ray. Maniac is an outstanding thriller one of Hammer’s lesser known gems. The Blu-ray release by Powerhouse Films is simply amazing.